Disney’s animated sequel, directed by Rich Moore and Phil Johnston. The story takes place six years after saving the arcade from Turbo’s vengeance. The Sugar Rush arcade cabinet has broken, forcing Ralph (John C. Reilly) and Vanellope (Sarah Silverman) to travel to the Internet via the newly-installed Wi-Fi router in Litwak’s Arcade to retrieve the piece capable of saving the game. In way over their heads, Ralph and Vanellope rely on the citizens of the internet, the netizens, and the Disney Princess lineup, to help navigate their way, including a webite entrepreneur named Yesss (Taraji P. Henson), who is the head algorithm and the heart and soul of trend-making site BuzzzTube. Ralph: Okay. My turn, my turn. Um, I got one. Ralph: Okay. Check this out. I spy with my little eye, something yellow and round, and it eats dots. Ralph: Yeah, seriously. You’re never going to get it. Vanellope: Well, obviously, it’s Pac-Man. Ralph: No, that’s not… Why is that obvious? Ralph: I can name two things. Ms. Pac-Man and Baby Pac-Man. Boom! I accept your apology. Vanellope: Yeah, you’re right. Okay. But was it Pac-Man? Mr. Litwak: Alright, let’s get you plugged in. Ralph: Wiffee or Wifey? Well, it’s either wiffle ball, or an arranged marriage game. Sonic: It’s actually pronounced Wi-Fi, Ralph. Virtual Security: Oh, no, it is not. That sign right there says Wi-Fi. What it should say is Die-Fi. Virtual Security: That’s a little humor there. But seriously, the Internet is nothing to laugh at. It is new, it is different, and therefore we should fear it. So keep out, for Pete’s sake, and get to work. The arcade’s about to open. Vanellope: Figures, we finally get something new plugged in, and we’re not even allowed to go in there. Vanellope: A new racing game would’ve been cool. Ralph: Something wrong with your game? Vanellope: No, no. It’s just every bonus level’s been unlocked. I know every shortcut. Man, I’d kill for even just a new track. Ralph: New track? You already got like three choices. Vanellope: Yeah, I know, but don’t you ever wish something new and different would happen in your game? Vanellope: Really? Well, agree to disagree. Ralph: Wait, I don’t want to disagree. Vanellope: No, no. It’s just a fancy way to say we don’t have to argue about it. Ralph: We’re arguing? I don’t want to argue. Vanellope: Relax. Stop making it a thing. Go to work. I’ll see you tonight, stench vessel. Vanellope: I can’t believe I don’t have a game anymore. I mean, like what am I going to do all day? Ralph: What? Come on, are you kidding? You sleep in, you do no work, then you go to Tapper’s with me every night. I’ve literally just described paradise. Vanellope: But I loved my game. Ralph: Oh, come on. You were just bellyaching about the tracks being too easy. Vanellope: No, that doesn’t mean I didn’t love it. Yeah, sure, it was kind of predictable, but still I never really knew what might happen in a race. And it’s that, it’s that feeling, that not knowing what’s coming next feeling. That’s the stuff. That feels like life to me. And if I’m not a racer, Ralph, what am I? Ralph: Well, you’re my best friend. Vanellope: No, I just, I’m sorry, I know I’m being weird. I think maybe I just need to be alone right now. Ralph: Start churning butter and put on your church shoes, little sister, because we’re about to blast off! Vanellope: What are you even talking about? Ralph: Oh, we’re going to the Internet. Ralph: Yeah, to find the part to fix your game. Ralph: Yeah, I probably should’ve just said, “We’re going to the Internet.” We’re going to the Internet! Ralph: So, all we got to do is find this eboy place. Ralph: Right, Ebay. So we go there, get the steering wheel, we have it delivered to Litwak before Friday. He’ll fix your game. Everything goes back to the way it was. Boom! Happily ever after. Vanellope: This is a shockingly sound, well thought out idea for you, Ralph. Ralph: No offense. I know. And none taken. Vanellope: Ooh, here it comes. Ladies and gentlemen, boys and girls, I give you the Internet! Ralph: Holy cow! Look at all this stuff. Vanellope: Woh. This is the most beautiful miracle I’ve ever seen. But it’s so big, it goes on forever and ever. KnowsMore: Welcome back to the Search Bar, madam. I hope you were able to find a satisfactory breakfast burrito, based upon the search results I provided this morning. What can KnowsMore help you find now? Ballet Mom: Where can I find ballet…? KnowsMore: Ballet shoes? Ballet classes? Ballet folklorico? Ballet Mom: …tights? Girls size small. KnowsMore: Oh, little Madeline’s trying ballet now, is she? I hope this lasts longer than the soccer phase. KnowsMore: Oh, hello, sir. Interesting, you don’t seem to have a search history. Well, let’s start one for you. What can KnowsMore help you find today? KnowsMore: Umbrella. Umbrage. Umami. Uma Thurman. KnowsMore: Noah’s Ark. No Doubt. Nordstrom Rack. KnowsMore: Ergonomics. Urban Outfitters. Urkel, played by Jaleel White. Ralph: Looks like no one put Humpty Dumpty together again. This guy’s a little soft-boiled. Vanellope: I’m pretty sure he’s just trying to guess what you’re going to say. KnowsMore: Yes. I’m sorry, but my autofill is a touch aggressive today. Vanellope: Let me try. Ebay Sugar Rush steering wheel. KnowsMore: Oh. I only found one result for your query. Hm. Isn’t that interesting? Ralph: What? How did you…? Vanellope: Ah, the Internet’s very intuitive. Thank you, Mr. KnowsMore. Ralph: Wow. I guess we know where to go if we ever need a pair of goggles. There’s a whole building full of them. Pop-Up #1: Congratulations, you’re a winner! Pop-Up #2: These ten child stars went to prison. Number six will amaze you. J.P. Spamley: Want to get rich playing video games? Click here to find out how. Ralph: But there’s a lot of cool stuff here. J.P. Spamley: I’ll be right here if you change your mind, brother. Auctioneer: Ladies and gentlemen, the next item a black velvet painting of sorrowful kitten. Bidding starts at forty-nine ninety-nine. Ebay Elayn: I’ll just need a credit card number. Ralph: Sorry, what’s a credit card number? Ebay Elayn: A credit card number. Ralph: Number. Right. Uh, seven. Ralph: Sorry, no. You’re right, ridiculous. I meant eleven. Ebay Elayn: Those aren’t credit card numbers. Ralph: I’m pretty sure they are. Ebay Elayn: How exactly do you intend to pay for this item, sir? You owe twenty-seven thousand and one dollars. Vanellope: Dollars? Dollars like money? Ebay Elayn: Yes, and if you don’t have a credit card, we also accept PayPal, Venmo, ProPay, SquareCash and BuzzzyBucks. Vanellope: You’re going to laugh. Okay. Vanellope: So this big galoot, he left his wallet at home. Ralph: Yeah, yeah, I did leave my wallet at home, in my wallet room, and the door’s locked. Ebay Elayn: Uh-huh. Look. If you don’t pay within twenty-four hours, you will be in violation of the unpaid item policy, you will forfeit the bid, and you will lose this item. Next! Ralph: Hey, buddy, you going to eboy? Well, I got some free advice for you. Don’t. What a scam! Ralph: We were so close, and we would have gotten… Look, their signs aren’t even real! J.P. Spamley: Want to get rich playing video games? Click right here to find out how. Pop-Up Blocker: Back off, pop-up! Pop-Up Blocker: Right this way, miss. J.P. Spamley: Dang pop-up blockers. Why does everybody got to be so mean? J.P. Spamley: Well, I got a guy in Des Moines, Iowa, who will pay forty grand for Shank’s car, from a game called Slaughter Race. J.P. Spamley: That’s right. Slaughter Race is the most popular online racing game out there. However, it is wicked dangerous. Ralph: We ain’t afraid of danger. This kid’s the best racer in the whole world. We’ll get you that car, no problemo. Vanellope: Okay, this game is kind of amazing. Ralph: Meh, the attention to detail is pretty impressive. Vanellope: Hey, where are you going? Ralph: I am scared. If we get burned up in here, that’s it, we’re dead, we’re gone. So, I think we should get out of here right now. Vanellope: No, wait, wait. I have an idea. Ralph: Where are you going? Kid, get back on the track. I’m going to lose my cookies! Vanellope: There is no track. I can drive anywhere! Shank: Yoh, Department of Noise, get out of my car! Vanellope: Oh, man, what are we going to do? Ralph: You just stay put, don’t panic. I’m going to talk to her. Ralph: It’s fine. This is what heroes do. Ralph: My bottom is stuck. Ralph: This car is not designed for a big boy, I’ll tell you that. Vanellope: Man, there are all kinds of videos in here. Ralph: Yeah, if you like babies and cats. Vanellope: Yeah, this lady named Shank, she actually made the video. She’s the one who told us to come see you. Yesss: No wonder your video is so dope. Shank is for real cool. Ralph: She is not. I’m the cool one getting all the hearts. Yesss: Well, that’s right, you big baby. Ralph: [to Vanellope] Kid, we came here to save your game and we’re going to do it. Yesss: I love it! Ha! That is what the Internet was made for! Now, let’s get to work. Vanellope: Oh, come on. Princesses and cartoon characters. Lame. Vanellope: Oh, I mean, no offense or anything. Disney Fan #1: Yeah, um, in Captain America: The First Avenger, Red Skull refers to Yggdrasil, the World Tree, Guardian of Wisdom and Fate. Are we to believe, sir, that you are a descendant of that tree? Disney Fan #1: Okay, okay. Thank you very much. Disney Fan #2: Um, what is Drax really like? Disney Fan #2: Thank you. Disney Fan #3: Yeah. Are you a conifer or a fruit-bearing tree? Vanellope: Excuse me. I’ll take this one. He is Groot, I am Vanellope, click here to meet Wreck-It Ralph. Vanellope: This is almost too easy. Stormtrooper: Hey, do you have a permit for that pop-up? Stormtrooper: That’s unauthorized clickbait. You’re coming with us, kid. Grumpy: Hey, can’t you read? Cast members only! Vanellope: Woh, woh, ladies! Ladies, I can explain. See, I’m a princess too. Vanellope: Yeah. Princess Vanellope Von Schweetz, of the, uh, Sugar Rush Von Schweetzes. I’m sure you’ve heard of us. It’d be embarrassing for you if you haven’t. Snow White: Have you ever had True Love’s Kiss? Vanellope: I don’t even have a mom. Rapunzel: And now for the million dollar question. Do people assume all your problems got solved because a big strong man showed up? Princesses: She is a princess! Cinderella: Who made your gown? I’ve never seen anything quite like it. Vanellope: Yoh, this old thing? Cinderella: Oh, I’d so love to have one of my own. Ariel: Oh! I want one too, you guys! Cinderella: I’ll get my mice on this. Cinderella: So this is love. All hail Princess Vanellope, the queen of comfy! Ariel: Of all the thingamabobs in this entire world, I never thought I’d get to wear a real, what’s it called again? Oh, yeah. Shirt. Belle: So this steering wheel you sing of, that’s a metaphor? Vanellope: Uh, no, no, no, it’s not a metaphor. I just, I literally want a steering wheel. I think the issue is I was a little pitchy. Mulan: Maybe a little. But sometimes your song can’t start until you go someplace to reflect. Vanellope: Right. Of course. Important water. I stare at the important water, and somehow magically I’ll start singing about my dream? Vanellope: Uh, yeah, I don’t think so, ladies, but thanks. C-3PO: Five minutes, Princesses. Another “Which Disney Princess Are You?” quizlet starts in five minutes. Tiana: Well, I guess it’s back to the gowns, girls. Merida: Arrch! Lang may yer lum reek, and may a moose ne’er leave your girnal with a tear drop in his eye. Haste ye back, me lassie! Vanellope: What did she just say? 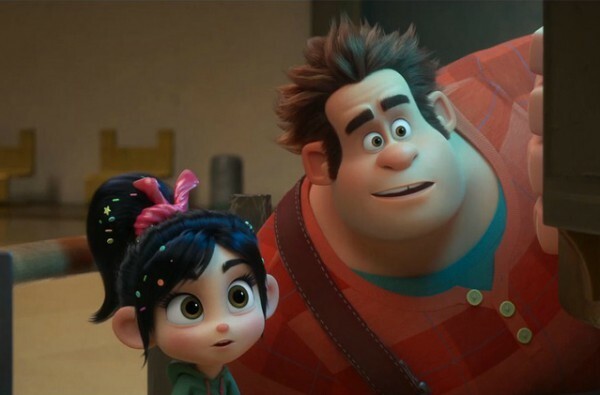 Vanellope: Hey, can I tell you something that I don’t think I could ever tell Ralph? Vanellope: I know it sounds crazy, but the second I walked into this game, it felt, well, it felt like home. I mean, more than Sugar Rush ever did. Shank: Oh, yeah? How so? Vanellope: Because it’s like my dream. It’s full of weirdos, and the racing is super dangerous, and you never know what’s going to happen next. I mean, back home, I know exactly what’s going to happen next, because Ralph’s dream is to do the same thing every day. Shank: Here’s something I wish I’d learned years ago. There is no law saying best friends have to have the same dreams. You know? Vanellope: Woh. Yeah. You are a very wise person, Shank. And a good friend too. Shank: You know, after you go home, and your life gets back to normal, you are always welcome here. Vanellope: But that’s the thing, I want this to be my normal. I want this to be my life. I can’t go home now. I just can’t. J.P. Spamley: You know, where I come from, that’s called a kick in the face. Ralph: I can’t believe it. J.P. Spamley: A straight-up donkey kick to the teeth. Ralph: She’s supposed to be my best friend. No, this can’t be right. No, she’s been brainwashed. That’s what this is. Because the Vanellope I know would never abandon me like that. I got to get her out of there now. J.P. Spamley: Hey, easy now, tiger. I admire the impulse, but you charge in there like some white knight, I mean, she’s liable to hold it against you. Ralph: So what? I’m supposed to just let her stay in a game that’s obviously bad for her? J.P. Spamley: Of course not. Ralph: Then how do I make her leave? She thinks it’s so cool and exciting in there. Unless you know how I can make the game boring or… Wait. You know about viruses and stuff, right, Spamley? Ralph: Back home, me and the kid used to goof off in this game called Tron. But then it got a virus that made the motorbikes go slow, and then Vanellope stopped wanting to hang out in there. So, is there a way to do something like that to Slaughter Race? J.P. Spamley: Oh, there’s ways. Follow me. J.P. Spamley: [to Ralph] Now, this area down here is what’s called the Darknet. A lot of shady characters hang out down here, so try to keep a low profile. J.P. Spamley: Double Dan, this dude is a virus-making machine. Oh, oh, here we go. Ralph: Are you sure this is safe? J.P. Spamley: [chuckles] Is it safe? Of course it is. Just whatever you do, do not look at his little brother. Ralph: Oh, he has a little brother? J.P. Spamley: Double Dan! Long time no see. Double Dan: Who are you? J.P. Spamley: JP Spamley. Uh, we met one time over at Friendster, which tells you it had to be a long time ago. Double Dan: Oye, what are you looking at? Double Dan: Are you looking at my brother? Double Dan: Don’t you look at my little brother. J.P. Spamley: Oh, no, I wasn’t! Double Dan: He’s very self-conscious! Shank: You didn’t tell Ralph yet, did you? Shank: Come on, V. He’s your best friend. You got to let him know you’re planning on staying here for a while. Ralph: I know, but he’s going to get really upset. Shank: Yeah, he might, but you guys, you’ll talk, you’ll work it out, you’ll figure it out. Ralph: Yeah, but what if we don’t? What if his feelings get hurt so bad he won’t want to be my friend anymore? Shank: Look, all friendships change. But the good ones, they get stronger because of it. Double Dan: What are you doing here? Ralph: Uh, the reason I came to your neck of the face… I mean, there’s a face in your neck. I mean, woods. Neck of the woods. The reason I’m here is because I, well, I heard a little tumor, rumor. I heard a rumor that you could, well, you could give me a harmless virus kind of thing that might be able to slow down the Slaughter Race game? Double Dan: Oh, yeah. My cousin Gordon told me that you wanted to crash it. Ralph: Crash it? No! No, no, no. No, I don’t want anyone getting hurt. If there’s a way to just, uh, I don’t know, just make the cars go slow or something, so the game is boring, and my friend comes back home to me. Vanellope: Ralph, I messed up so bad. Ralph: No. No, you didn’t, it’s okay. Vanellope: This is all because of me and my glitch. I should’ve just stayed with you instead of following some stupid dream. I’ve ruined everything. Ralph: Uh, look. I didn’t mean for it to happen like this. It was not supposed to be this bad. Vanellope: You didn’t mean for what to happen? Ralph: I might’ve, kind of, sort of put a harmless little virus in the game. Vanellope: A virus? You did this? Ralph: Well, I wouldn’t have done anything if I hadn’t heard you tell Shank that you wanted to live in Slaughter Race forever. Vanellope: So you were spying on me? Ralph: Hey. You’re not exactly innocent here. You were going to ditch everybody and abandon Sugar Rush. Vanellope: Oh, please. I’m one of sixteen racers. They’d never miss me. Vanellope: Why would I ever spend another second with you after what you did? Ralph: Vanellope, where are you going? Ralph: Wait a minute. I can explain. Vanellope: No! You will not follow me! Vanellope: A friend would never do what you did. Never! So you leave me alone! Ralph: Vanellope, no, no, no! Please! Please! What did I do? KnowsMore: I found a hundred and thirty results for “Where does my high school girlfriend live now?” You’re welcome. Yesss: Guess I forgot to tell Ralph that when you break the Internet, you don’t literally have to break the Internet. Vanellope: I can’t believe he did this. Yesss: Yeah, well, I mean, dude obviously made some real questionable choices here. But he also made a bee pun to save his best friend’s game. So, what can I say, kid, life’s complicated. Rapunzel: Look up there! It’s a big strong man in need of rescuing. Ralph: Wait a minute. Who are all of you? Jasmine: We’re friends of Vanellope’s. Elsa: Yeah, and any friend of Vanellope’s is a friend of ours. Ralph: You know what I just realized? The sun never rises or sets here because everything’s always on. Vanellope: Well, now isn’t that an astute observation? Ralph: I know, right? You know, other than KnowsMore, I’m probably the smartest guy on the Internet. Ralph: I guess that’s pretty much all the news I got for you. Vanellope: Oh, man, your stories never disappoint, Ralph. I just wish we could hang out sooner. Ralph: Yeah. Me, too. When did you say you were getting those days off? Vanellope: Uh, our upgrade starts on January 25th, so like two months from now. Ralph: Oh, that’ll go by in a flash. Oh, speaking of which, you want me to bring you anything from home when I come visit? Vanellope: Oh! You know what I cannot find anywhere on the Internet? A halfway decent BurgerTime burger. I’ve been talking them up to Shank and the crew. And honestly, I think they’re starting to think I’m making it up. Ralph: Alright, consider it done. I’ll bring you guys a truckload. Well, sun’s coming up already. Guess I better get to it. Vanellope: Yeah, me too. Talk next week? Ralph: I shall await your call, madam. Vanellope: Then, adieu, adieu, farting is such sweet sorrow. So long, stinkbrain. Felix: Hey. You doing okay there, Ralph? Ralph: Yeah, I am, actually. I’m doing great. Felix: Come on, Felix. Let’s get to work, buddy. Mo’s Mom: Hey, Mo, did you like the movie, sweetie? Baby Mo: Well, there was a scene in the trailer that wasn’t in the movie, and that makes me sad. Mo’s Mom: Oh, that’s too bad. Maybe playing your game will cheer you up. Ralph: Ooh, ooh, ooh. I want to try, I want to try, I want to try! My turn, my turn! Ralph: Pancake. Milkshake. Milkshake. Milkshake. Ralph: Pancake. Pancake. Milkshake. Milkshake. I’m starting to understand why people like this game. Very zen. Vanellope: Hey, everybody, look what I found! More pancakes! Ralph: Sweet! Let’s speed it up. Ralph: Pancake, pancake, pancake. Pancake, pancake, pancake. Pancake, pancake, pancake. Pancake, pancake, pancake! Eat, little bunny! Eat, eat, eat! Vanellope: Uh, Ralph, you might want to try feeding the kitty for a little while. Ralph: No, the kitty gets the milkshake. The bunny gets the pancake. Ralph: [singing] Never gonna give you up, never gonna let you down, never gonna run around and desert you. Never gonna make you cry, never gonna say goodbye, never gonna tell a lie and hurt you. What do think of the Ralph Breaks the Internet quotes? Let us know what you think in the comments below as we’d love to know. I’m trying to find the vanellope quote after she returns from slaughter race when she’s talking about her love of the game where she feels free when she’s racing and not confined. And how she feels most alive.